Try our delicious Double Tomato Stuffed Omelet made with Campbell's® Condensed Tomato Soup. Combined with eggs, parmesan & blue cheese, onion, and garlic to soup mixture, this omelet makes for a delicious breakfast menu item. 1. In large pot heat oil over medium-high heat. Add onions and sauté 2 minutes. 2. Stir in peppers. Continue cooking 2 minutes. 3. Add garlic. Sauté 1 minute. 4. Add first listed Campbell's® Condensed Tomato Soup and water. Bring to a simmer, stirring to incorporate. Reduce heat and simmer 30 minutes or until thickened and smooth, stirring occasionally. 1. In mixer equipped with a paddle, whisk together cream cheese until smooth. 2. 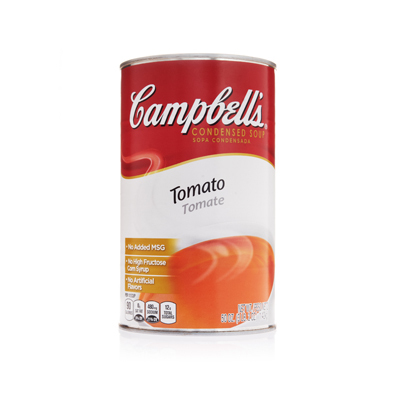 Stir in second listed Campbell's® Condensed Tomato Soup. 3. Add cheeses, scallion and pepper. Continue to blend until incorporated. Cover and refrigerate for at least 2 hours. egg, large, lightly beaten	 48 oz. 24 ea. 1. In a mixing bowl whisk together eggs, third listed Campbell's® Condensed Tomato Soup and pepper until smooth. Keep chilled until ready to cook. Spray small non-stick skillet with vegetable oil cooking spray. Heat until almost hot over medium heat. Ladle 1¼ cups of egg-tomato batter into skillet. Cook omelet to desired doneness. 3. Using a #30 scoop, dollop 2 plus tablespoons filling onto one side of omelet. When almost cooked through fold omelet in half to cover filling. Let finish cooking and slide onto serving plate. 4. 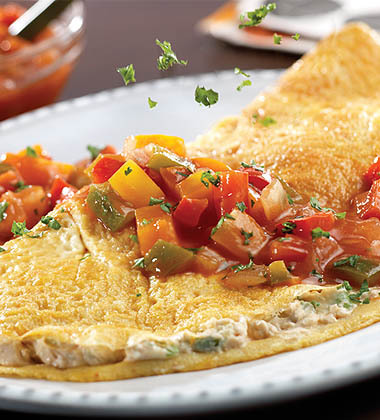 To Serve: Using a 4 oz ladle, top each omelet with ½ cup hot Tomato-Pepper Sauce. Sprinkle with a pinch of minced parsley. Serve immediately. egg	 48 oz. 24 ea.